I’m fairly new to Top Ten Tuesday, and I was gone all weekend for a last minute trip to the mountains, so I wasn’t going to do this week’s topic. But then I got to thinking about it, and here I am. Now, I’ve only done eleven TTT’s, so instead of listing everything but one post, I’ve selected my five favorites. And – for once – this is in order of my favorite TTT’s to write. 1. 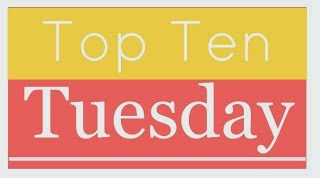 Top Ten Books Featuring Characters Who … Enjoy Food – I struggled thinking about this open ended list, but once I settled on food I had so much fun writing it! 2. Top Ten Books I will Probably Never Read – I wasn’t sure I was going to like this topic. I mean, how do you single out books that you’re not going to read? But once I started thinking about it, it turned into a list of (mostly) books I really would like to read but I know for one reason or another I probably never will. I think it was the gifs and pictures I added. I had tons of fun with that. 3. Top Ten Books You Would Like to Step Into – This was a completely open topic, and a struggle for me to decide what to write about. Once I hit my idea, it was tough to limit my books just to ten. 4. Top Ten Inspiring Quotes from Books – Who doesn’t love a list of inspiring book quotes? 5. Top Ten ALL TIME Favorite Authors – I couldn’t keep this list to 10 – I had a few honorable mentions. And I’m glad to have this list here so I can see how it changes (and stays the same) as my reading continues to evolve. Looking forward to more Top Ten Tuesdays. And more fun gifs. It almost felt cathartic to make a list of books I’m never going to read. We’re always talking about books we’ve read or are planning to, but it’s rare to bring up the books we’re never going to pick up. I listed the quotes topic as well for this week’s list. LOL I barely had enough, it felt like cheating if I just slapped them all on here. I saw some people selected the top ten they *wished* they had done, that was a smart way to approach it. Inspiring Quotes seems to be a popular one this week – I know I liked it too! I felt like I didn’t participate in enough to do this week but I should have just shortened it – you’re smart! I really loved the quotes one and books to movies we would like to see. I saw some other people who did Top Ten lists they wished they had done, that was a good approach too! I agree about the never going to read list. It was therapeutic to admit that I probably was never going to read certain books! I always struggle a little with the opened ended topics but they frequently end up being my favorites. Yes I’m not good with open ended either – it can be difficult to think of a good idea that will work. But I agree, once you get going it is fun! Oh the top ten characters who enjoy food is a good one. I love food! Love the idea for ‘Characters Who Enjoy Food’! (Seriously, I was already hungry before reading that list and I so didn’t need to be reminded of Hannah Swensen’s bakery.) And I love your take on ‘Books I’ll Probably Never Read’. I kind of went the easy way. But then again, I’ve read books that two years ago I said I’d probably never read. *shrugs* You never know. Thanks for stopping by my blog earlier.